Since its first steps, Vaarwel revealed a very experimental mood with this project. His albums move between drone, ambient, electronic, atmospheric black metal, industrial, dark metal, neoclassical, depressive black metal, post rock and even punk! There are huge differences between his works, depending on the genre or combination of genres he chooses each time, but at least every album has a common atmosphere. “The Dyson Swarm” has clearly a space orientation and as it is stated in the band’s official page “it is devoted to the place of humanity in space, both close and outer, and merely is like a journey through the cosmos“. Its sound is a beautiful mix of space ambient, dark atmospheric metal and electronic music, while 5 of the album’s 7 compositions are instrumental. Melodic synths, ambient sounds, acoustic guitars, electronic drum beats, sci-fi effects, distorted blackened guitars and few screaming background vocals and chant-like recitations create a really unique atmosphere and a very beautiful album! The songs move in mid-tempo rhythms and dark melancholic moods, while the combination of the rhythmic electronic elements with the melodic nature of his music is outstanding. 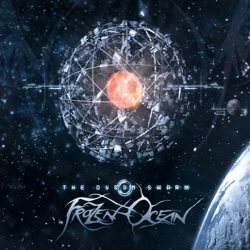 What is also very important is that in this genre, where repetition is the biggest enemy, Frozen Ocean manage to create 7 totally different and distinct songs, in an album that lasts for almost 50 minutes! Additionally, Frozen Ocean have a crystal clear sound and a very professional production. It’s not the type of music I use to listen to, but I really believe this is a great work! If you already know this band and the experimental nature of its sole member, then you should invest without any second thoughts. If you’ve never heard of them before and you’d like to explore an electronic space ambient dark metal album, then “The Dyson Swarm” is a great suggestion. It is released via Kristallblut Records in a limited to 500 copies deluxe 6-panel digipak edition, including all the lyrics. The wonderful artwork and layout design is by Phlegeton Art Studio. You can visit the band’s official pages for more info about this interesting project and you can also listen to the official album teaser below in order to get a first taste of the album.